I did it! I freakin did it! I finished The Ultimate Reset! The last three days were much easier than I thought they would be….well, Saturday aka Day 20 was a little tricky. Since I was so close to being done I had a few moments where I said to myself, “Oh, I can do whatever I want today….I’ve made it this far.” Somehow something snapped in my brain every time this happened and got me back on track. Sunday was an awesome day….I was traveling and somehow stayed on track until the evening, where I celebrated the Reset being over with a tiny piece of the homemade coconut cake I made for my mom’s birthday. I made this decision because I had completed all of my supplements so everything was technically over, and I wanted to celebrate my mom. I have no regrets. Waking up this morning I felt wicked awesome. I snapped this picture really fast after i put my contacts in because I was incredibly anxious to compare what I saw in the mirror to the before photos I took Day 1. I was very pleased. I’ll be sharing my official photos a little later, but let me drop a few numbers with you….over the 21 days I lost 9 pounds and almost 3 inches from my waist. I also lost about 1/2 each from each of my thighs. I’m very much okay with those numbers. Yes, losing some weight and inches is cool and all, but my motive for doing this program wasn’t to have a massive transformation. I wanted to prove to myself that I could do this program…..I knew it was more mental than anything. I wanted to see if I could really live the vegetarian lifestyle….and if I could avoid my friends coffee, cheese, and doughnuts. Most importantly, I wanted the result that many people rave about after completion: a strong appreciation for food in general and how it impacted my body. –My sleep improved: I think we all know I’m a night owl that survives on a strange amount of sleep. I work mostly at night and often don’t have the best night’s sleep. I now realize how much the quality of food I eat impacts the quality of my sleep. During these three weeks I slept like a baby….I woke up rested and felt terrific. On the few occasions where I slipped up (Krista’s baby shower and the doughnut incident especially), my sleep was off and I noticed a difference. –Skin clarity: I usually have pretty clear skin, which I attribute to my daily dose of Shakeology, however, with the focus I had on my water intake each day I saw even more improvement. Even during that time of the month (sorry, dudes who are reading this), I didn’t have any breakouts or issues. –No digestive issues or bloat: Well, the majority of the time. On those occasions where I messed up my stomach let me know what was up immediately. If you recall, on one of the occasions I shared a photo here on the blog where I looked pregnant because of how bloated I was (thanks, little piece of pizza). I had the same issue with the doughnut. Currently I am reading the book Wheat Belly, which discusses how gluten can impact your body. After my isolated incidents during the Reset, I can attest to the fact that my body and gluten do not get along….which I’ve always suspected. Awhile back a doctor told me I had celiac disease, which was later proven to be a false diagnosis, but I always questioned whether or not I had an intolerance. Moving forward I am going to be majorly avoiding gluten. –An appreciation for how great my body feels: I shared this image and quote awhile back, and it continues to ring true with this experience. Internally, my body felt incredible….it’s hard to describe. It just felt clean and good. Since I am being honest with you guys, I did struggle with this challenge, and it wasn’t just because I was without my BFF Coffee. Don’t get me wrong….it was tough and there were moments I felt like a drug addict going through withdrawal, but I didn’t cheat one time with coffee. The biggest struggle for me: the exercise and lack thereof. I finished the 3 Week Yoga Retreat, but I hated every minute of it. Like I said before, it just wasn’t for me, and even as a fitness professional there will be workouts that don’t gel with me. This is one of them. Sorry, yogis. You can keep your cow and downward dog poses….i’m happy to return to munchkin claps and genie tuck jumps. Exercise is something so much more to me, and I don’t know if I can ever properly describe it. It’s therapy for me; it’s the one part of my day where I feel like a normal human being….the one part of my day where i momentarily forget about the huge hole in my heart and the grief I live with daily. It’s the time where I get out my emotions…my anger…my sadness…and my frustrations. Going three weeks without a serious sweat session did a number on me. I felt moody and depressed, and I’m pretty sure I wasn’t exactly a peach to be around. So the emotional aspect of this Reset…..yeah, it was rough for me. Today I resumed normal exercise, starting back with the 21 Day Fix since the workout calendar aligns perfectly with my upcoming trip to Punta Cana. It felt amazing to be sweating and jumping and tossing around weights. I had coffee…pretty much immediately, and it was such a lovely reunion. I introduced eggs and meat back into my diet and my body felt sluggish and uncomfortable most of the day. I knew that would happen as I reintroduced foods to my body. Overall, my mood returned to normal….I was happy to be back in my normal routine. Would I recommend The Ultimate Reset? Yes, I would. I think everyone should do it once. You learn things about yourself….not only about what foods cause problems, but how much you appreciate other foods and what they can do for your body. You learn about willpower and getting through something incredibly challenging. You just grow as a person. Am I upset I had a few slip ups? Not at all. In fact, I think everyone doing this program should have a few. Why? I immediately saw how that food impacted my body, and I could associate the negative feelings and effects to one particular food. When you are focused on a restricted diet it is much easier to do that. I am thankful for those “bad” moments during the Reset; I truly think I had a better appreciation for my body and the foods I ate after that because I could see the difference. I’m glad I did it, but as glad as I am that I did it, I’m even happier that it is over. Would I do this again? Possibly. If I was ever on bed rest or restricted from exercise, then yes. That is the only way though….I’m not giving up exercise again unless a doctor says so. I’ve got to give a huge shoutout to all of you and those in my daily life who have been holding me accountable…..I know I have been a challenge, but you all have kept me on track and helped me so much. Crossing The Ultimate Reset off my 2017 Vision Board and moving onto the next adventure. Oh yeah, and about that vegetarian thing….no way in hell. I’m a carnivore, and there’s no tap dancing around it. Back with my boo coffee. The end is so close I can taste it! Let me recap the past two days for you. For some reason, I am still more focused this week than I have the previous two weeks. I swear, people in my life have been tempting the heck out of me, but I have not fallen victim once. NOT ONE CHEAT…not ONE! I ended up changing up my meal plan a little bit because i fell so in love with the Coconut Collard Greens that I have been eating them with every dinner…..you have to try them. I’m already working on my meal plan for next week and guess what….they are making an appearance again! 1. How am I surviving without coffee? To be honest, I am still riding the struggle bus with this…..coffee is such a huge part of my daily routine, and I can’t begin to tell you how many times I have gone to grab a mug from the cupboard and make a cup. I thought for sure I would cheat and have a cup at least once, especially with all my travel….I pass Dunkin and Starbucks on nearly every trip. Not giving in to coffee is something that I am extremely proud of myself for doing. I’ve saved a lot of money by not stopping, I will tell you that. 2. Have I been using my pre workout, Energize? No. Energize is all natural, and some people claimed to have used it while on the UR. Since I was only doing yoga, I didn’t feel like I needed the extra jump on my workout. You better believe I’ll be back at it Monday. I love that stuff! 2 Days Left of Yoga! 3. What has been the hardest part of the Reset? For me, not doing intense workouts. I know a lot of people love yoga…bless your hearts….but it isn’t for me. All of us have workouts we love and workouts we don’t connect to as much….this just happened to be that workout for me. Besides the fact that I love high intensity workouts and a solid sweat, workouts truly are therapy for me. Ever since my dad passed away, I have relied on my workouts to help me feel better. They put me in a good mood and give me a sense of accomplishment, plus I know my dad would be proud since he was always very focused on living a quality, healthy life. My mood has been very much a roller coaster, and I’ve been more depressed over these few weeks than I have for a long time. I truly feel like this is tied directly to exercise. 4. Am I really eating only fruit for breakfast? Yes, yes I am, and I actually like it. Since I have always struggled with my purple containers, this helps me get them in early. I also have all day to burn them off, which is great because of the slow to digest sugar found in it, as well as the carbohydrates. 5. What am I craving? I have no idea why, but Filet O Fish sandwiches from McDonalds. I don’t even like them, but they have been on my mind 24/7. WTF. They say the foods you crave the most are the foods that are the worst for you…..clearly I am an example of this. The warmer weather has helped me get outside a bit more….the dogs love walks, and it makes me feel like I am kind of exercising when Im not really. I finally was able to break in one of my new pairs of shoes….how cute are these? Incredibly comfortable, too. Hope you all are having a great Friday! Don’t forget, if you want to jump in my Operation: Fit-ish Online Challenge Group, deadline to register is Monday! To register, please complete the quick form HERE. It’s going to be a lot of fun….I’ll be doing the 21 Day Fix, but it is an open Beachbody group, meaning any program you want! Can’t wait to get Fit-ish AF with y’all! If you ever have to interact with me before 10am, there is one piece of information about me that you absolutely must know. Correction: You need me to have coffee. I very much like to get up early, and I very much like to be productive. Often I am doing work before the sun comes up….sometimes even holding conference calls where interaction is a must. When this happens, I am already about 3 cups in. I’m a busy person with deadlines, an Inbox constantly full of emails, videos to record, trainings to lead, meal plans to create, exercises to do….coffee is to me what gas is to a car. I don’t go without it. During the month of May I had an amazing little surprise from Panera: free coffee for the entire month. I like having a My Rewards card, but to be honest, I don’t use it all that much because I pack my meals and stick to my meal plan. However, when I learned of this little gift from the coffee fairy, I took advantage of it every.single.day. In fact, I am now on a first name basis with the barista, Brianne, and I have a little morning gang I see daily that is composed of 4 gentlemen all in their 80’s. Panera, I love you and please, feel free to share this with me any time you wish. It absolutely was an amazing gift. 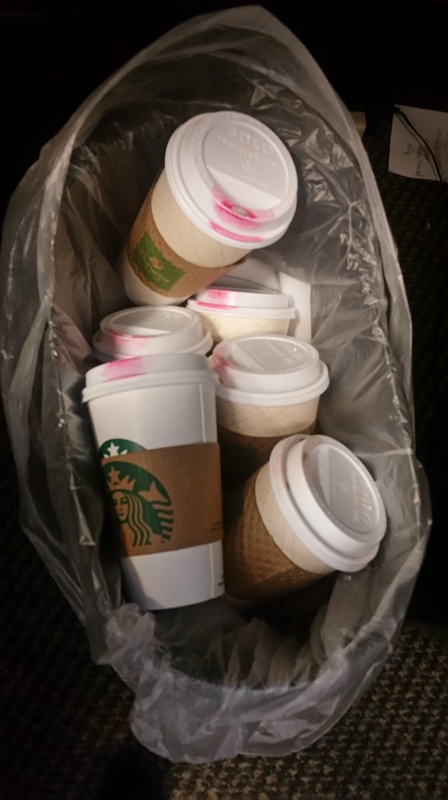 One day a few weeks ago I posted this picture on my Facebook to showcase my coffee cup cemetery (and my strong lipstick game). An acquaintance of mine messaged me and told me that I needed to stop drinking coffee because it was healthy. No, no it’s not, acquaintance. You clearly haven’t had your coffee and are not thinking correctly. Back when I didn’t care about my health, I had no problem ordering the fattiest drinks on the menu or overloading my coffee with those delicious creamers (hello, Samoa creamer….I am talking to you). However, I have learned about how bad some of those drinks are for you and have made modifications. I’m not saying I don’t enjoy a Gingerbread Latte from Starbucks here or there, but when I do I get my soy milk fix and drink them sparingly. 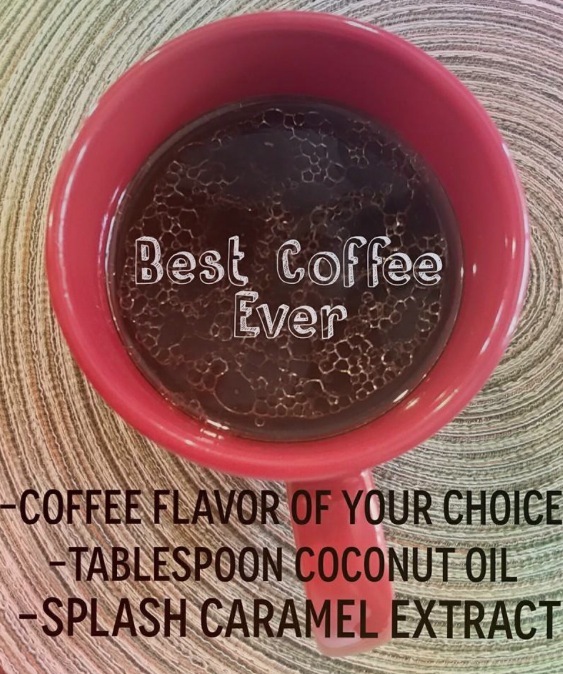 My favorite way to have my coffee involves the secret gem of the kitchen, coconut oil. Are you using it? Im serious, you should be. I use coconut oil for so many things that I probably should devote a blog to it so you can learn how versatile it is. My favorite use is putting it into my coffee. Not only do I love the taste, but it helps me avoid the “I need the sweet creamer taste” that I used to get back when I was going through creamer withdrawal. Here’s how I make my coffee. P.S. You can use any kind of extract your heart desires, but I love caramel, hazelnut, and vanilla. So back to my acquaintance telling me coffee wasn’t good for me. I’d like to share with you some of the health benefits so you can see for yourself that, just like milk, it does a body good. Reasons why Coffee is the bomb.com. Benefit #1: It increases energy levels so you don’t feel as tired. Benefit #2: It helps boost your metabolic rate by as much as 11%….. meaning it helps you burn fat. Benefit #3: It DOESN’T contribute to high blood pressure, like sodas do. 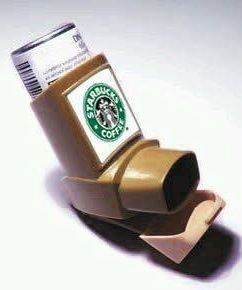 Benefit #4: It assists with the increase in adrenaline in the bloodstream. Benefit #5: The smell of coffee decreases stress. Benefit #6: It is a huge source of antioxidants and helps fight free radicals. Benefit #7: It helps your memory…..moderate amounts of caffeine increases the size of the hippocampus, which assists with long term and short term memory. Benefit #8: 200 to 300mg of caffeine helps your heart perform better by improving the blood flow. Benefit #9: It helps reduce the risk of diseases such as cirrhosis, Alzheimers, diabetes, gout, liver disease, and cancer. Benefit #10: It can help suppress your appetite . Here’s to all of you whose blood type is also Starbucks. 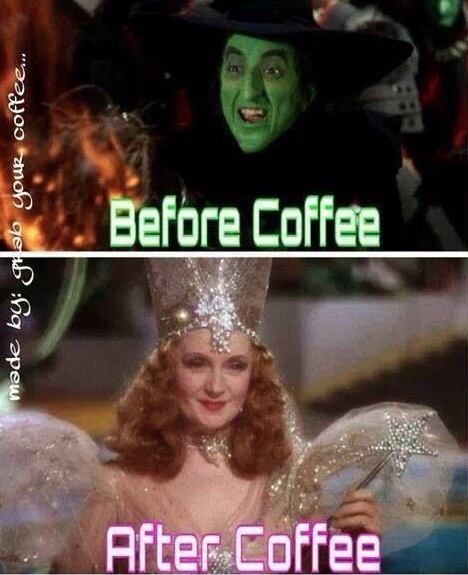 And based on the fact this blog entry is posting at almost midnight, someone better make sure I am caffeinated in the morning…..or else you may be seeing the Wicked Witch.